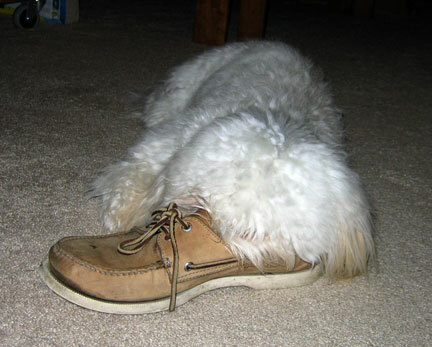 Mojo likes playing with socks, but I never knew he liked foot odor so much...until now. Yesterday was the make-up class for agility. Wow, it was fun. Ela and Mojo ran it, and did great! It was raining, and even though the course is covered Mojo got into some wet areas and was a wet, dust-covered mess. Plus, when we got home he had diarrhea, probably from an old treat he found on the course. Yuck. So he got bathed. An agility master is coming to town in Jan, so we'll probably sign up for the class and go. Mojo's such a natural at this that he can't not compete in agility. The great thing at agility was Mojo was able to play with other dogs. Finally! It's like they'd never stop playing with each other. He'll have one or two daycares before our next trip, so that'll have to do until next year. 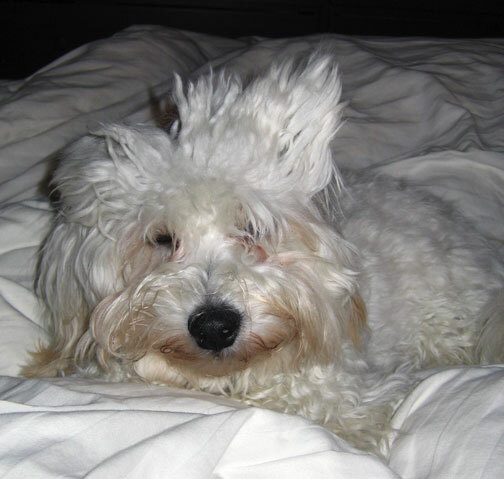 Even dogs can have bad hair days. 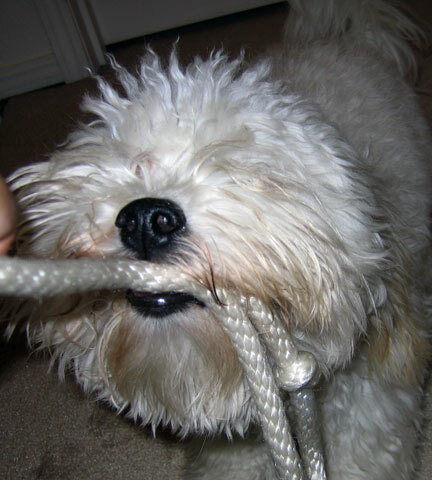 This is a close up of what Mojo looks like when he's performing the rope tug. 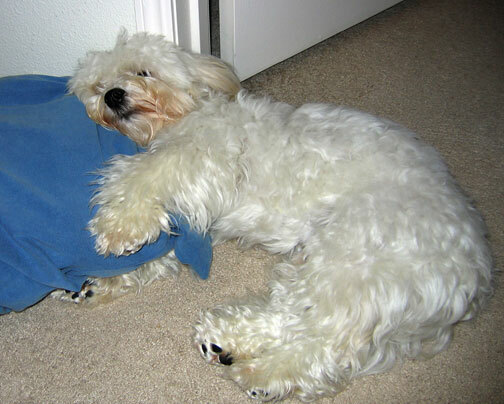 Anytime can be nap time when you're a dog. Mojo's mats got worse, but we combed or cut them out. His coat is coming in, and it's really nice. It's smooth and shiny, except for a big swath on his back. The swath of fur on his back is kind of rough feeling (just rougher than the rest), and it's also a bit apricot colored. I combed his ears the other day, and man, almost half the hair on his ears fell out. That's where mats come from: hair that fell off and stuck. Oh, he did something kind of gross while I was combing. While I comb, hair collects on the brush. Every once in a while I pull the hair off of the brush and put it in a small pile. The pile gets kinda big after a while. Well, I looked away, then heard Mojo chewing something. I turned back to see what it was, and noticed the pile of hair was gone. Oh no! He was chewing his dead hair! Before I could do anything, he swallowed his hairball. Gross! No harm done, as far as I can tell. Lastly, he's pooped outside twice since we got back. Not sure what the deal is with that.